Fishing for trout with flies is like solving a puzzle. The current, the fish, the bugs under the surface and in the air all seem indecipherable. The clues are there however. The key to discovering them is never the same. But slowly, with much patience, and relying upon an ever-expanding body of experience collected over a series of seasons, the code can sometimes, although by no means always, be broken. To do so requires an understanding of those insects that live in the streams where you fish, which for me is here in northwest New Jersey. There are three principal types of aquatic insects upon which trout feed ­ stoneflies, mayflies and caddis flies. There are many different species within each of these three groups, each identified by color, size, behavior and the time of year that it emerges en masse from the stream. This emergence, called a hatch by fly fishers, occurs, give or take a few days or a week, at the same time each year, depending upon temperature, water level, and changes to the stream brought on by a previous year's drought or flood. The trout can go on a feeding frenzy during these peak times of insect activity, but can also be very selective. This is when fly fishers seek to "match the hatch" with their imitations. From March, continuing into April, darkly-colored stoneflies can be seen hovering over the surface of the water and crawling along the branches of streamside bushes, boulders and logs. Soon, the first major mayfly hatch of the season ­ the Blue Quill hatch will begin, followed quickly by another species of mayfly, called the Quill Gordon by fly fishers. (Named after Theodore Gordon, the father of American Fly Fishing, an angler who spent much of his time mastering the trout of the Neversink River located not far from northern New Jersey in the southern section of the Catskill Mountains.) Caddis flies come later in the season and, for this reason, will not be discussed in this article. Stoneflies spend most of their lives crawling along the bottom of the stream as nymphs. Trout feed on nymphs throughout the year, finding them drifting with the current, clinging to rocks and other underwater debris and crawling along the bottom of the stream. Fly fishers, hoping to imitate stonefly and mayfly nymphs, frequently cast their flies along or near the stream bottom. Before the major mayfly hatches begin, stoneflies migrate from the stream. Called Early Browns by fly fishers, in flight these early-season stoneflies appear to be black rather than brown. Triggered by their movement, the trout begin to feed on the nymphs. For this reason, an imitation dead-drifted under the current during this time of year may be ignored while one twitched or pulled will result in a vicious strike. This hatch will progress for two weeks or more with stoneflies crawling onto boulders and logs where they will shed their nymphal shells and emerge with four wings folded flat along the top of their bodies. You can find their abandoned exoskeletons on rocks and fallen trees in those rivers with a heavy concentration of these aquatic bugs. Unlike mayflies, which appear to drift gracefully through the air like puffs of pollen, adult stoneflies hover over the stream like tiny helicopters, the adults whirling upward into the surrounding bushes and trees. After mating, the females return to the stream, darting about, trying to break through the surface to lay their eggs, which will begin the cycle once again. It is this action that can sometimes catch the trout's attention, a twitch of a black stonefly imitation triggering strike after strike. This can be great fun and is usually one of the first opportunities of the season to match a hatch here in western New Jersey. Soon after the black stoneflies appear, a number of different mayflies begin to hatch, sometimes orderly and in succession, but usually confusingly with one hatch overlapping another. The three early-season mayfly hatches are well known by fly fishers here in western New Jersey and the Poconos. First to appear are the Blue Quills with the Quill Gordons following soon thereafter. Later, usually by at least a week or so and about the same time as the first caddis hatch, are the Hendricksons. Earlier generations of fly fishers provided these names for the major mayfly families of early spring, names easier to pronounce than the Latin names used by entomologists. For instance, the Latin name for the Blue Quills is Paraleptophlebia adoptiva. This early-season mayfly has dun-colored wings and appears light gray or blue in flight, but upon closer examination has a mahogany body. Blue Quills have three tails and are similar in color and in the number of their tails to the male Hendrickson. Entomologists classify Hendricksons, whose hatch begins after that of the Blue Quills, as Ephemerella subvari. Fortunately, the two mayflies can be easily distinguished because the Blue Quills are nearly half the size of the larger Hendricksons. Hatching between these two mayflies, and sometimes around the same time as the Blue Quills, are the Quill Gordons, known by their Latin name as Epeorus pleuralis. Quill Gordons are closer in size to the Blue Quills, but differ in color and the number of tails. They have an olive-green body with two tails rather than three. It is impossible to distinguish among these mayflies as they ride down with the current or float above the surface of the stream. So when you see some guy, his fly vest flapping from side to side, his legs hopping from rock to rock, his arms swinging wildly in the air, you'll know he is not some wild man of the woods, but merely a fly fisher attempting to capture a mayfly in flight. Like stoneflies, mayflies also begin their lives as nymphs crawling along the bottom of the stream. Although trout feed on mayfly nymphs throughout the year, they gorge on them as they rise toward the surface. The flies in these photos imitate a mayfly at different stages in its life cycle. The “Emerger” pattern (top) imitates the mayfly emerging from its nymphal shuck while suspended in the surface of the stream. The wing of this fly was made from fur of a snowshoe rabbit. The dun (bottom) imitates the insect after it has emerged from its nymphal shuck. 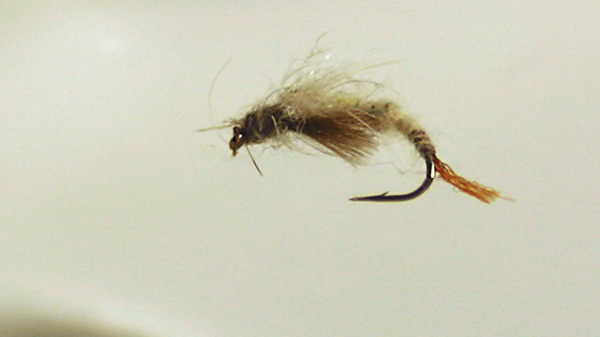 This fly was tied in the traditional manner using rooster hackle. Unlike stoneflies, which crawl onto rocks to shed their skins, most mayflies emerge from their nymphal shells at or near the stream's surface where they are most vulnerable, sometimes becoming trapped in the surface film. 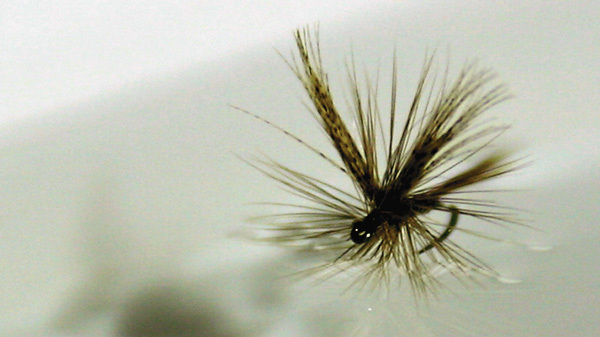 Fly fishers use emerger patterns to fool those trout that key in on this phase of the hatch. Having emerged, mayflies sometimes float for some time while drying their wings, looking like miniature yachts tacking against the wind, their gossamer wings held upright rather than flat like those of the stoneflies or folded back like a pup tent, the way caddis will do. Some trout will switch their attention to this stage of the mayfly, called a dun by fly fishers. Phoebes, swallows, and other songbirds swoop down upon the duns as the mayflies eventually fly from the stream's surface toward bushes and trees. Later in the day or early the next morning, the duns molt a second time and fly off to mate in swarms that seem to waver above the stream. Afterward, the males fall to the surface and die. If it's evening, bats will sweep through the mass of insects while the trout feed upon these dead and dying "spinners" as they are now called. Finally, the females return to the surface, laying eggs, which once again brings out the birds and stimulates the trout into rising. The longer the hatch continues the more selective the trout become. Many times, a particular trout will feed solely on the rising nymphs, while another is taking only emergers and still another the duns floating upon the surface. To complicate matters, a fish may suddenly switch from one stage of the hatch to another. A hatch of stoneflies, mayflies or caddis can continue for minutes or hours each day lasting for a week or more with the spinners and egg layers returning each evening or early morning. This all happens with little fanfare, except for the occasional swooping bird or telltale rings of a rising trout. One must look carefully, returning often to the stream before becoming familiar with this silent opera. The fly fisher's dilemma is compounded when more than one hatch occurs at the same time, which happens more and more frequently as the season progresses -- stoneflies, caddis, and more than one species of mayfly hatching simultaneously. During times like this, many an angler has left the stream shaking his head in defeat while the sound of rising trout continues to splash around him. When I was younger, I carried every conceivable imitation in my fly vest. Eventually, the vest became so weighed down with fly boxes that I couldn't remember what pocket contained which flies. One winter, in a sudden burst of inspiration, I used a waterproof marker on the outside of each pocket to identify the flies hidden within. I remember thinking how clever I was to write their names upside down so that I could easily look down and locate them while wading up the stream. Sometime during that season an old guy in a pair of patched hippers passed by. I noticed that he did not have a vest, but carried a single small box of flies in the chest pocket of his flannel shirt. As he looked me over, a smile crept over his lips. "Son, you must have been a hellava boy scout," he quipped. All those flies did not improve my ability to take trout and in fact probably detracted from it. Hell, I was carrying flies to imitate caddis that would not be hatching for another month, mayfly imitations that had long since hatched and patterns of stoneflies found only in Montana. It was only years later that I thought to break down the season into months and then into weeks, concentrating on what was happening at that particular time, carrying only those flies necessary for that time of year. If you are fishing for trout in northwest New Jersey during early April, try carrying a few black stonefly imitations, maybe a Black Gnat wet fly and a few black elk-hair caddis. 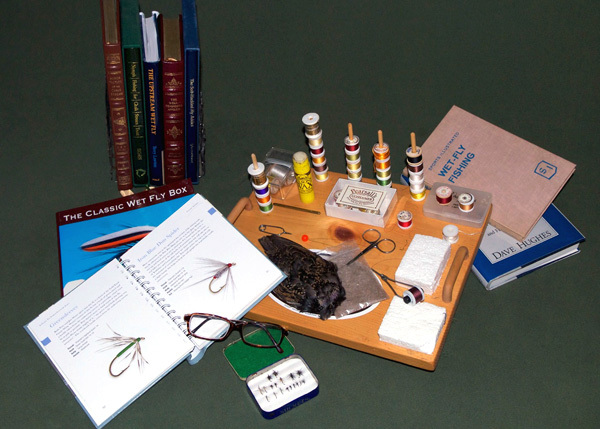 Add a number of Blue Quill and Quill Gordon dry flies. Don't forget some emerger patterns and maybe a couple of Gold-ribbed Hare's Ear nymphs and wet flies just for luck. Think about leaving your remaining flies at home, taking them with you only as needed to match the many hatches that will be coming as the season progresses. Oh, and if you see me on the stream, stop and say hello. I'll be the old guy in hippers, without a fly vest. A Blairstown resident , Bob Romano has written fine books and essays about fly-fishing and the lessons the sport holds regarding nature and life. 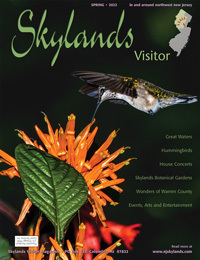 All books can be obtained through Birchbrook Press or by calling (607) 746 7453. For more information contact Bob Romano via email.